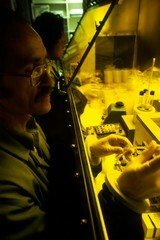 A Caucasian male technician is performing cell culture work. Noticeable is the yellow glow of ultraviolet light, which maintains the sterile conditions in the laboratory. These cell cultures are used for in vitro carcinogenesis assays.